The Burjan Farm is one of a number of working family farms operating in Readington Township. Joyce Burjan, her two sons, Martin and Daniel, their families, and her daughter Chris, raise hay, straw and grains for feed, and pheasants for sale to hunters. The pheasants are used to stock many of the Counties hunting grounds. The recently preserved farm is located just north of the village of Three Bridges on Old York Road. In October signs around town invite neighbors to stop by the farm to pick their own pumpkins. a. 240 acres, Farmland Preservation. c. Raises game pheasants, grains and hay. 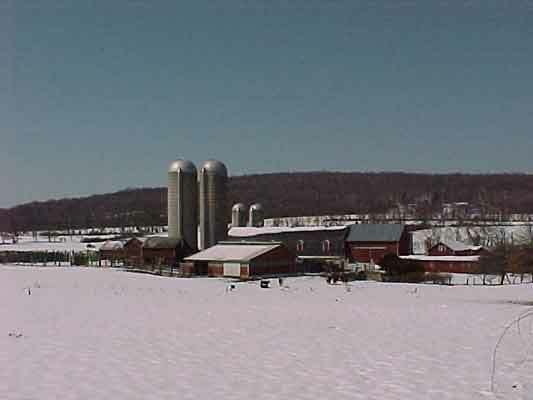 The Walter Kanach family ran a herd of dairy cows on this 82-acre farm for many decades before Readington Township purchased it as part of a 440-acre preservation project. In 2001, the farm was auctioned with a deed restriction to assure that the farm would be preserved for agriculture and conservation in perpetuity. The Chesla family, successful bidders for the farm, is presently busily restoring the farms historic barns and house. a. 82 acres, Green Acres Conservation Easement. c. Former dairy farm, now growing corn and hay. 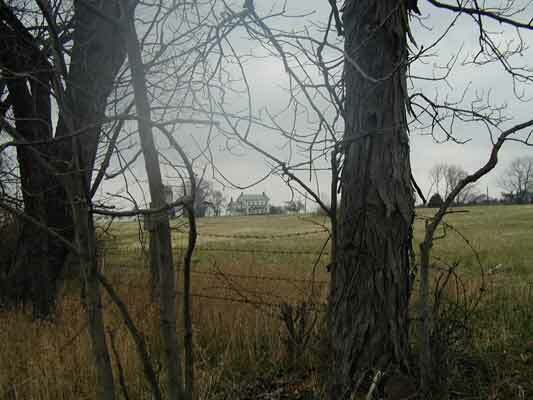 This 49 acre farm on Pleasant Run Road was preserved with the help of Green Acres and the Trust for Public Lands. Its preservation assures that a favorite view shed along one of Readington’s most scenic roads is protected. The Zweerink family has lovingly restored the historic house and barns. They presently keep horses, raise sheep and sell fresh eggs. a. 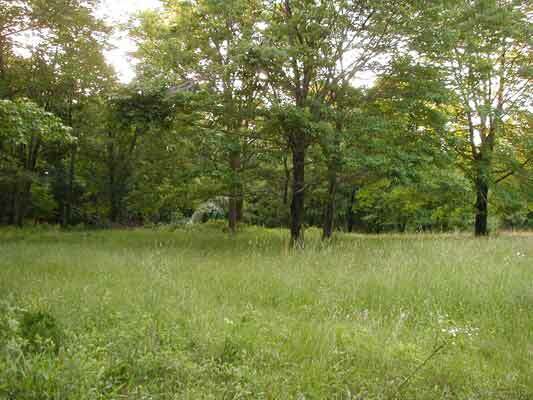 49 acres, Green Acres Conservation Easement. c. Raises horses, and sheep, produces eggs and grains. The preservation of the 800-acre former Sam Kanach Farm allowed Bill Mason to buy an additional 160 acres of preserved land and expand his family farm to 247 acres. He and his grandson, Judd Walters, presently raise cows, pigs, hay and grains. Proudly displaying a “Preserved Farmland” sign, the farm fronts on both Old York Road and Higginsville Road just north of Three Bridges. a. 247 acres, Farmland Preservation. c. Raises cows and pigs, produces grains and hay. 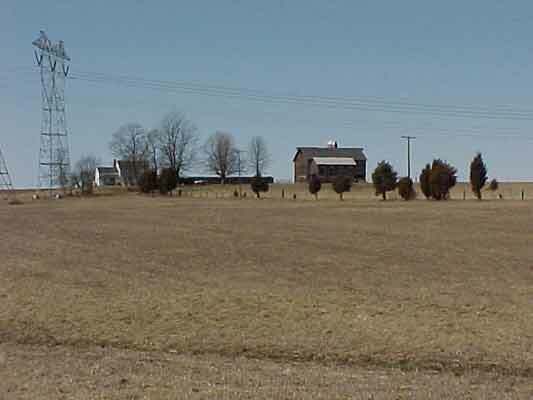 Most are already familiar with the “Buffalo Farm” on County Route 523. Walter and Ann Dobozynski formerly ran this scenic 230-acre farm as a dairy, but sold it to the state for preservation in 1995. Scarlot and Jerry Doyle and their son Eric were the successful bidders on the preserved farm. Township residents can now drive in on weekends to visit the farm store and purchase locally grown buffalo meat. a. 233 acres, Farmland Preservation. c. Raises buffalo and pigs, produces hay and grains. Things haven't changed much on Cole Road thanks to Readington's preservation efforts. 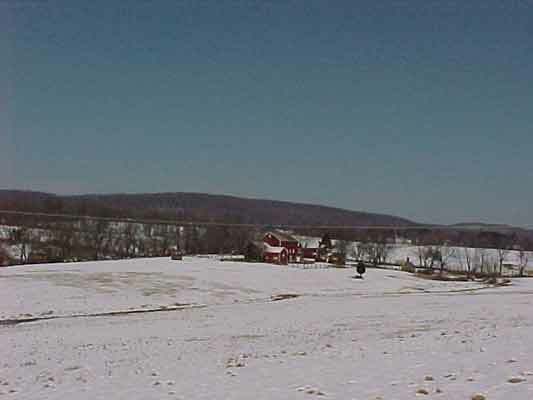 This view across the 110-acre Kowal Farm was preserved as part of a 183-acre preservation project completed in 1999 with the joint cooperation of Green Acres, the Farmland Preservation Program and the New Jersey Conservation Foundation. a. 110 acres, Farmland Preservation. c. Raises grain and hay. Sometimes a place is so special that everyone agrees it should be preserved for future generations to enjoy just like it is. This park on Woodschurch Road is such a place. Feel free to drive in, park and take a hike up Round Mountain. Trails starting just past the historic barns and across the open fields connect with the counties Round Mountain Preserve. 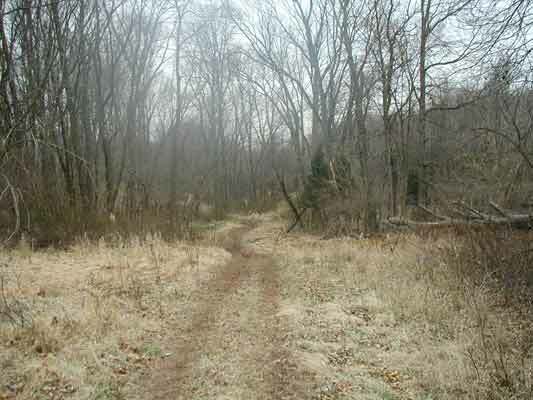 One of the nicest mature forests in Hunterdon is found on Round Mountain where over 300 acres has been purchased with Green Acres money and is open to the public. a. 97 acres, Green Acres, Public Land. b. Location, Woodschurch Road, adjacent to Round Mountain. c. Includes historic barns as well as fields and woodland for hiking. Connects to County parkland on Round Mountain. 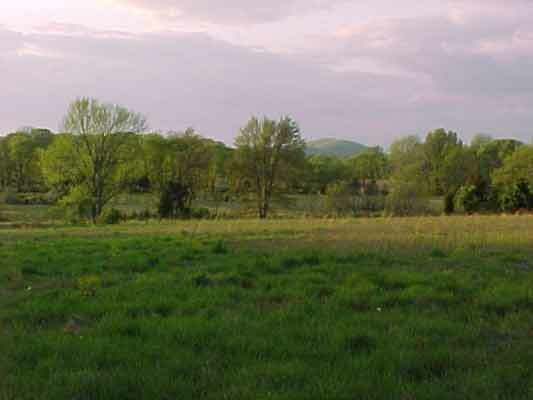 This large expanse of open, rolling farmland was just preserved through the joint effort of Readington Township and the State of New Jersey's Green Trust Program. 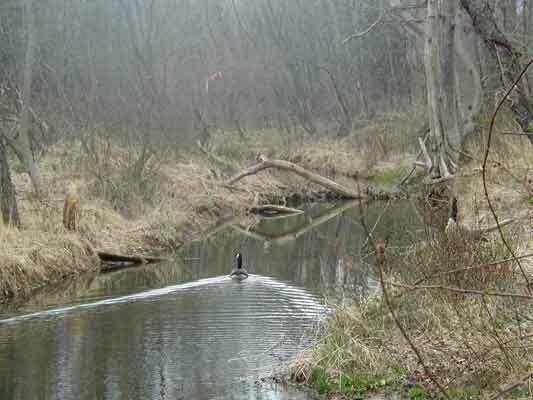 The land has been preserved with 100% state funds for the purpose of providing watershed protection for the South Branch of the Raritan River and for wildlife habitat protection. The land can be accessed from either River Avenue or from Rockafellows Mill Road. a. 346 acre, Green Acres Public Land. b. Location, Rockafellows Mill Road and River Avenue. 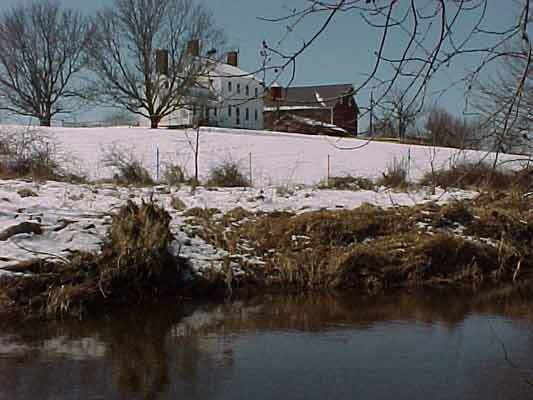 c. Includes historic house and fields and woodland for hiking. The folks living in East Whitehouse have known for years that a short walk through the woods north of town rewards the hiker with a beautiful view of the Rockaway Creek from the atop high bluffs that overlook the river. Today, most of these woods, a total of 113 acres has been preserved using Green Acres funds and a whole new generation of East Whitehouse kids will have the opportunity to enjoy these woods. c. Hiking trails through wooded land and along the Rockaway Creek.